Refillable Ink Tank, Wireless All-In-One for High Volume Printing with Fax. Photo (4 x 6″): PP-201 / Borderless: approx. 60secs. Paper Weight Rear Tray Plain Paper: 64 – 105g/m2 , Canon specialty paper: max paper weight: approx. A4 Colour / 300dpi: Approx. 19sec. 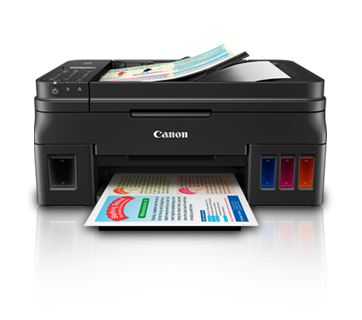 Click here for Document Print and Copy Speed Measurement Conditions Document: Color sFCOT / Simplex: approx. 24secs. *1 Ink droplets can be placed with a pitch of 1/4800 in. at minimum. *4 TWAIN driver (ScanGear is based on the TWAIN specification V1.9 and requires the Data Source Manager comes with the operating system. *10 Black & white documents fax transmission speed is based on default setting using ITU-T No.1 chart. *12 Resolution may be changed between Direct print and printing from PC. *13 The amount of image extension beyond the paper cannot be adjusted. *15 For the temperature and humidity conditions of papers such as photo paper, refer to the paper’s packaging or the supplied instructions. *16 Acoustic Noise is measured based on ISO7779 standard. *17 When printing ISO / JIS-SCID N2 on 4 x 6″ Photo Paper Plus Glossy II using default settings. *18 Copy: When copying ISO / JIS-SCID N2 (printed by inkjet printer) on A4 size plain paper using default settings. *19 1 – 11 in US, CND, LTN, BRA, TW and HK. • Using non-genuine inks may affect the printer’s performance and/or the print quality. In some rare occasions, although there are no safety issues, using non-genuine inks has caused overheating of the print head and smoke emission from the print head due to the absence of an ingredient found in genuine ink. (Does not apply to usage of all non-genuine inks.